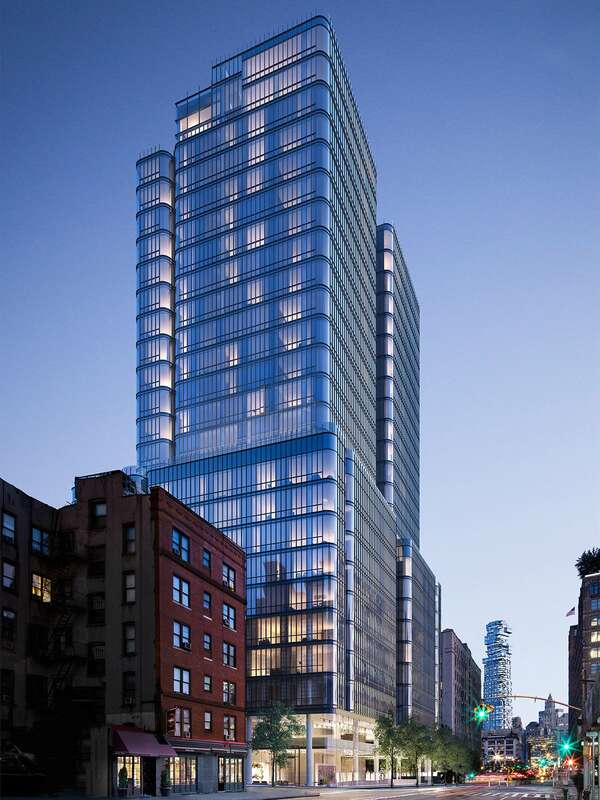 For 565 Broome SoHo, Renzo Piano set out to create a building shaped by light. The end result is a high-end condominium surrounded by a glass structure with curved corners. 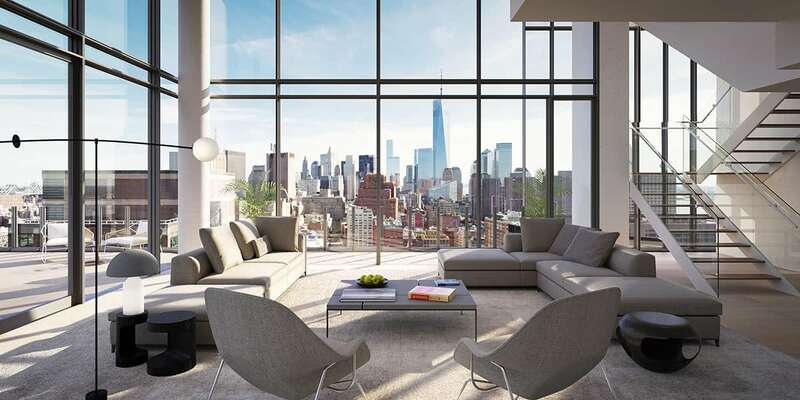 The residences are filled with light and offer a 360-degree view of the Hudson River and One World Trade Center. 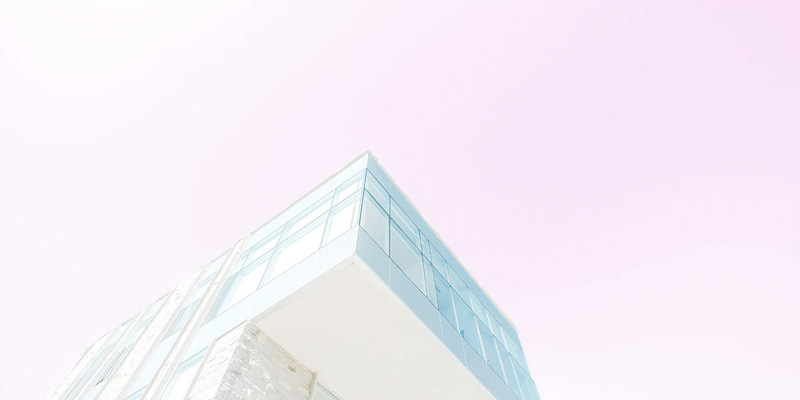 A unique crystal-like glass was selected for the exterior to allow the façade to take on the colour of the weather while providing clear views from the interiors. All 112 residences, ranging from studios to four-bedroom condominium homes, were thoughtfully designed to maximize space and views. RPBW and RDAI enhanced the open layout of early industrial SoHo lofts by utilising ultra-transparent glass for the oversized windows and neutral tones to communicate harmony, calm and expansiveness. 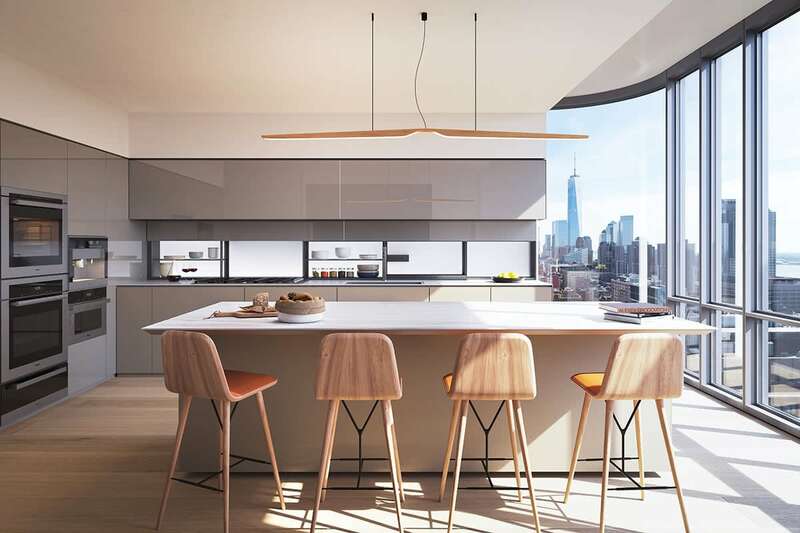 565 Broome Soho recently unveiled the first of its penthouses apartment, located on the northern side of the building. Spanning 6,655 square feet, the duplex penthouse features four bedrooms, and four and a half bathrooms for $40.5 million. The lower level of the penthouse offers a double height space with floor to ceiling windows. Owners of the apartment will have access to two private terraces and an integrated Miele-designed kitchen. The penthouse’s four bedrooms with ensuite bathrooms are all located on the upper level. The master bedroom comes with two walk-in closets and a master bath with heated flooring. 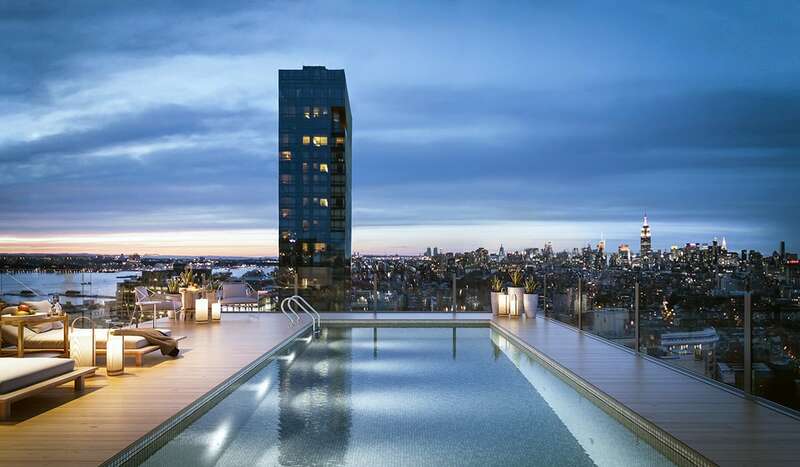 The 565 Broome SoHo penthouse also has a 2,500-square-foot private roof deck with a 20-foot long outdoor swimming pool. 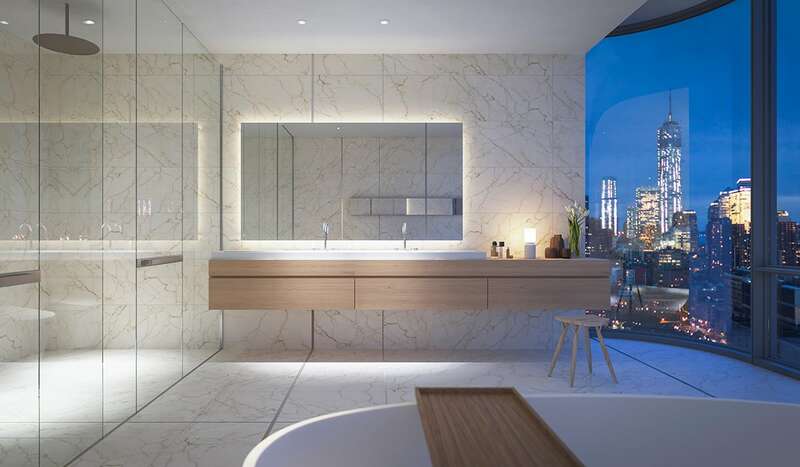 Other apartment sizes available at 565 Broome SoHo range from 990 square feet one bedroom starting at $2,075,000 to 2,519 square feet four bedrooms starting at $8,450,000. Shared amenities at 565 Broome SoHo span across 17,000 square feet. The condominium has a private gated driveway that leads to a covered porte-cochere. Wellness amenities include a heated, 55-foot indoor swimming pool, changing rooms, steam rooms and sauna, and a fitness centre. 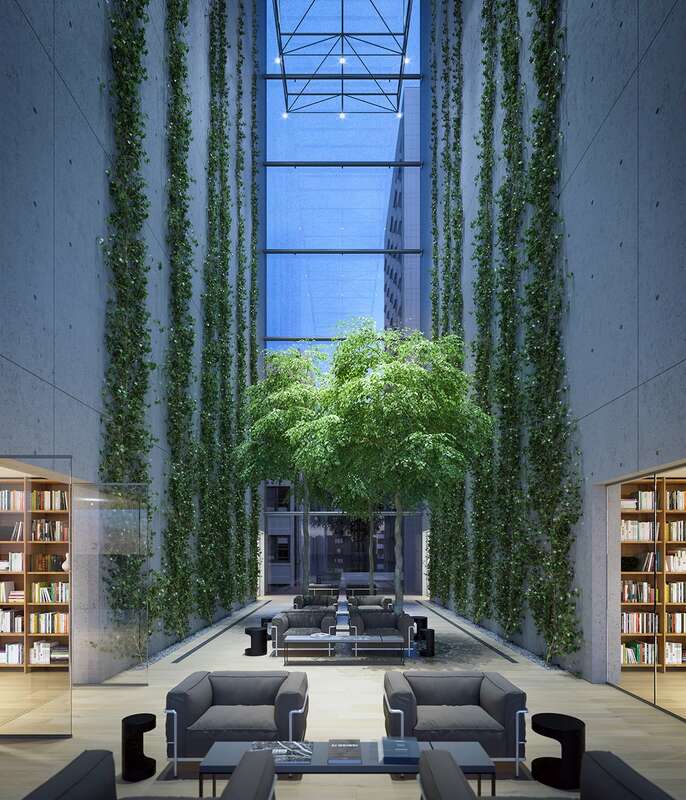 565 Broome SoHo residents will also enjoy an outdoor garden and an interior lounge with a 92-foot high ceiling and a live green wall. 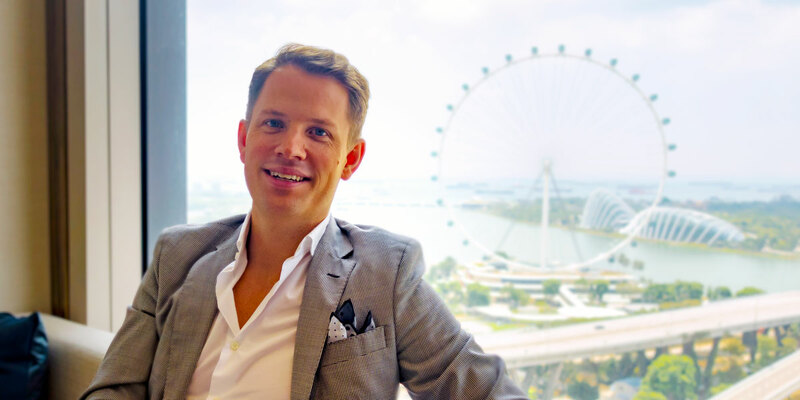 The condo is also equipped with a library, a wet bar, a children’s playroom, a 24-hour concierge lobby, a common laundry room and access to a 76 bicycle storage space. In terms of parking, 565 Broome SoHo comes with the latest automated parking technology. 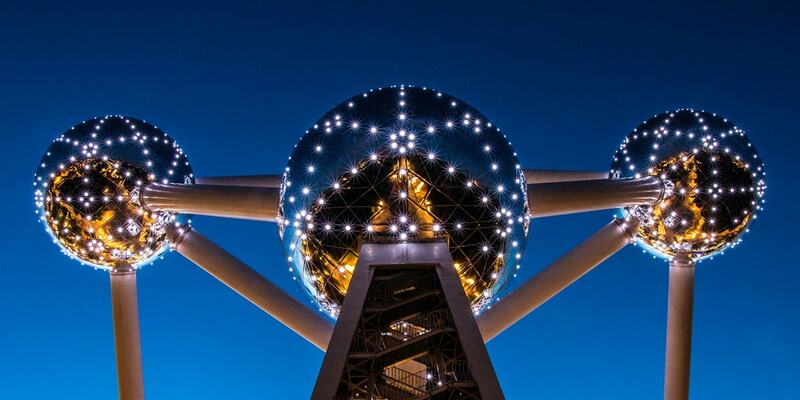 There are 42 parking spots available, each equipped with a full capacity electric charging station. 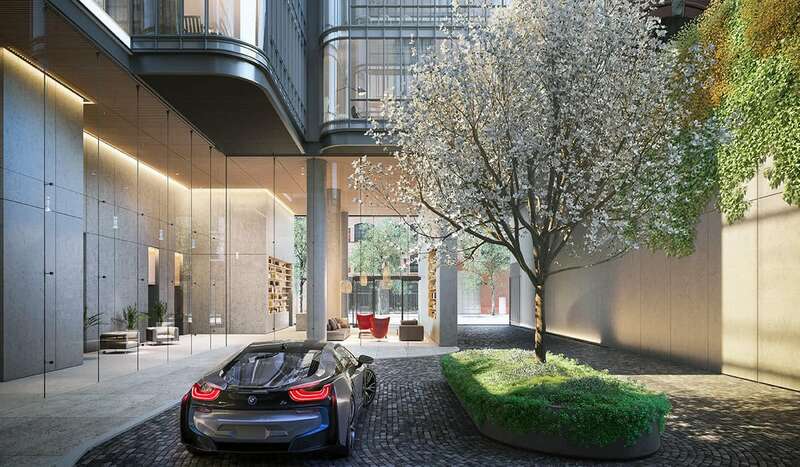 Residents of 565 Broome SoHo will also have an exclusive access to ReachNow’s BMW mobility services that provide access to onsite shared BMW and MINI vehicles. Following the completion of the Whitney Museum of American Art, 565 Broome SoHo is the first residential building designed by Renzo Piano in New York City, a visionary architect named by Time magazine as one of the top 100 most influential people in the world. The luxurious 565 Broome SoHo condo is located above the entrance to Holland Tunnel on the Freeman Plaza. The SoHo neighbourhood is home to museums and high-end galleries such as The Judd Foundation, The Drawing Center, Center for Italian Modern Art, Team Gallery and Peter Freeman, Inc. Broome street is surrounded by luxury retail and fine dining options, including Prada, Louis Vuitton, Alexander Wang, Chanel, Material Good, Balthazar, The Dutch, Shuka and Blue Ribbon Brasserie.